The Vista L5 is the latest addition to the revolutionary Jands Vista range of consoles and control surfaces. While keeping all the superb features of the original, the L5’s powerful new Version 2 software combines with a massive screen, backlit keyboard, Linux operating system and abundant processing power to create a whole new Vista experience. Owning a Vista L5 is now even more affordable. The new L5 / 4096 comes with an 8 universe dongle, allowing you to control up to 4096 DMX channels but if you ever find that’s not enough your dongle can be upgraded to 8192 channels. For even bigger shows you can also add a D1 distributed processing unit. The Vista S1 is a small and portable control surface that‘s ideal if you have to travel a lot to deliver your shows, or if your venue doesn‘t need lots of playbacks or has limited space. Designed to be used with a laptop, the S1 is a powerful and flexible live control surface that‘s compact enough to qualify as carry-on luggage. The Jands Vista D1 expands the DMX processing capabilities of the entire Vista range. The rack mount D1 connects via Ethernet to a Vista console, Windows or Mac system and provides an additional 8192 channels (16 DMX universes). For even bigger systems just add more D1s. 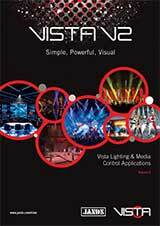 Download the latest V2 software for the revolutionary Vista lighting console. Available for Mac and Windows PCs. This version is fully functional but without a Vista USB dongle will blackout periodically.